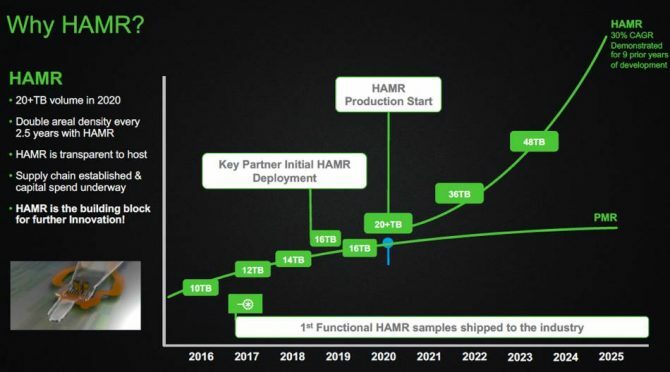 A roadmap from Seagate reveals that the company might be able to release 100TB hard disk drives by 2025. To achieve this high capacity in traditional magnetic drives, the HDDs will use a technology called Heat Assisted Magnetic Recording (HAMR). On HDDs with HAMR technology, the disk is heated for less than 1 nanosecond during writes. The heat makes the disk much more receptive to magnetic effects, which allows the HDD to write data on a much smaller region, thus increasing data density. Seagate has been working on HAMR technology since the late 1990s, and now hopes to release the first HDD samples that utilize HAMR technology to its partners. These disks should be sent out before the end of this year. With the technology Seagate hopes to double areal density every 2.5 years, making 48TB disks possible by 2023 and 100TB disks by 2025/2026. First mass production of HAMR based HDDs should start by 2020 with initially capacities of around 20TB.